I was thrilled to see Sydney's own furniture designer Henry Wilson profiled on Remodelista last week. 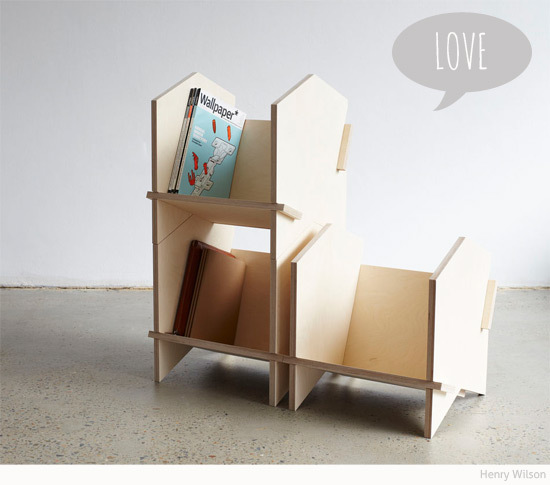 Henry has invented a fantastic joinery system that allows his furniture to be flat-packed and self-assembled. I particularly love this Chevron Shelf modular shelving system that would make a fantastic minimalist bookshelf for kids in a bedroom or toy room. Stack and join for different configurations. The shelf angle allows for easy packing away - and that's a huge bonus. You can find Henry Wilson furniture in his online store.